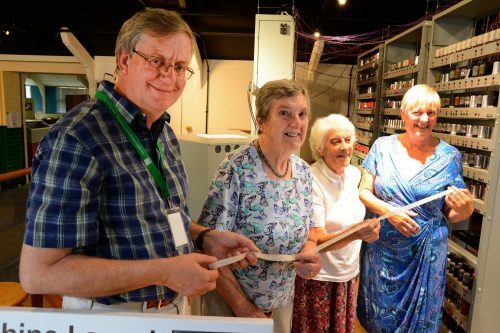 EDSAC Project leader shows original EDSAC users, Joyce Wheeler, Margaret Marrs and Liz Howe, a reconstructed paper tape that ran a very early computer find-a-prime-number program. 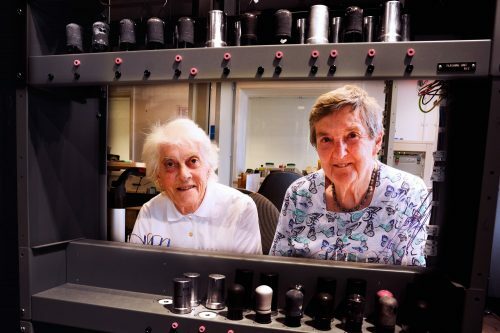 Margaret Marrs and Joyce Wheeler inspecting the reconstruction of a computer they used seven decades ago. They think the new version is “much too clean!”. EDSAC, the Electronic Delay Storage Automatic Calculator, was built immediately after World War II by a team led by Sir Maurice Wilkes in the Mathematical Laboratory of the University of Cambridge. It was one of the first practical general purpose computers and was used by scientific researchers across the University. The EDSAC design was later developed to create LEO, the world’s first business computer.